SecureVideo - How do I access my API Key? An application programming interface (API) allows one software program to talk to another software program. Our API allows a program developer to integrate SecureVideo into your company's software, so they work together as if they were a single application. SecureVideo's API is available for an additional fee. Once an API key has been activated for your account, you can access your API key with the instructions below. 1. 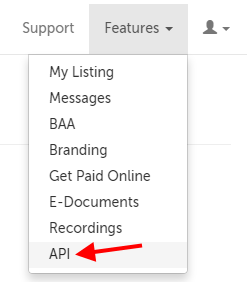 Click on the "Features" tab and select "API" from the drop-down menu. 2. Use the "View Keys" button in the lower left-hand corner. Your API Identifier and API Secret Key will appear in that space.